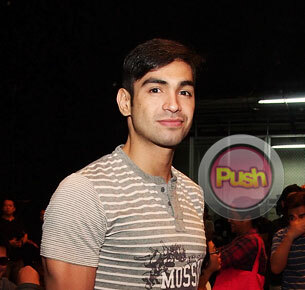 Carlos Agassi says he is head over heels in love right now with his Fil-British girlfriend. After almost a year of steadily dating Fil-British model Margo Midwinter, Carlos Agassi said that he has already found the love of his life. The pair was last spotted attending the Star Magic Ball together earlier this month where Carlos proudly introduced his date to the media. It was also the first time he brought a date to the prestigious Kapamilya event. “This is Margo Midwinter. She’s my date…for life (laughs). Hopefully,” he said with a smile. Carlos revealed that he and Margo first started out as friends but he eventually asked her out on a one-on-one date. “We just clicked. We just got along and parang everything fell in place. By accident, people thought she was my girlfriend on the first date and then in parties we were together and then we found out we had common friends because I didn’t know her friends were my friends and we both loved the same things so we just clicked,” he said. As they celebrate their first year anniversary this December, Carlos said it was only lately that Margo found out that he was a celebrity. “Mga four months na kami, she still didn’t know na I was an artista. Because I didn’t say anything. She just thought I had lots of friends when people take photos when we’re in public, like when we watch movies or go grocery shopping, she just thinks I’m friends with everybody (laughs). That’s what she thought,” he recalled. Carlos said that although Margo is a law student in the United Kingdom, she came to the country to pursue a modeling career. They have also met each other’s families already. “Actually, my family met her on our first date. That’s why it’s so weird. I invited her out to watch a movie and by accident I had a basketball game and a family reunion dinner that same day. And then I met her mom, just like that. Wow talaga, it was very fast and everybody thought na parang tinatanong nila, ‘Girlfriend mo?’ Nabigla ako,” he admitted. Carlos said he loves the fact that he and Margo have a lot in common. “Kasi nga nung first night everybody thought she was already my girlfriend on the first date and then we just clicked. Parang kasi hindi ako marunong manligaw eh, lahat ng nagiging GF ko, either classmate ko sa school or ganyan. So with her, kasi I don’t drink, I don’t smoke, and ganun din siya. We love watching movies, she also loves doing charity. When I work out, she does her own workout so it works. Everything fell into place. Okay talaga,” he said. The actor said he is not bothered by their age gap and that he already feels like he is ready to settle down already. “I guess yes kasi I met finally the right one. We’re ten years apart so we don’t look it, but when she feels like settling down I’m cool with that,” he said.